Campingplass Les Portes de l'Anjou er en campingplass i Durtal, Maine-et-Loire, som ligger ved en elv/bekk. Denne campingplassen har steder med avgrensning, med skygge, uten skygge og plasser med noe skygge. Det er mulig å leie stasjonære campingvogner og hytter. Campingplassen har lekeplass og idrettsplass. For sportslige feriegjester arrangerer campingplassen ulike sykkelturer. Det er underholdningsprogram. Campingplassen har utendørs svømmebasseng og barnebasseng. Det er ikke alltid nødvendig å lage mat selv, for på campingplassen er det snackbar og pizzeria. På campingplassen kan man også kjøpe nybakt brød. Det er mulig å bruke internett, for på 80% av campingplassen kan man få tilgang til internett med egen laptop. Denne inspektøren besøker hvert år Campingplass Les Portes de l'Anjou og inspiserer campingplassen for ca. 200 fasiliteter og for andre punkt som forekommer. Inspektøren er en medarbeider fra ACSI og arbeider ikke for campingplassen. We used this as a one night stop, but were given a warm welcome and a decent takeaway! Spent two nights here as we wanted to visit the Chateau in Durtal. We were very happy with the site and had a pitch looking over the Loire. Durham is well worth visiting. Would definitely stay again. A very pretty well kept site - quiet when we visited. Big pitches separated by very pretty shrubs and most of them overlook the river. Lots of nice walks if travelling with a dog and good for motorhomes as town and patisserie a pleasant 5 minute walk along the river. Heated unisex showers which were very clean. Stayed here one night. No restaurant or bar open. Although the site is nice - some large pitches, clean toilet and shower block with lovely hot water, the town of Durtal itself let the site down. There is only really the Chateau to see and that is not open very often to the public. The few restaurants were all closed! Would I go back - no. We had planned to stay only one night but the location ( lovely views of river), peace and proximity to the town made us decide to stay a little longer. We will defiantly return again, good stop for travelling South from Cherbourg. An excellent choice for our first visit to France. The staff were always extremely helpful, toilets and showers very clean and a beautiful location on the banks of the river. Thoroughly recommended. Very good campsite. Very clean facilities and loads of hot water for showers and washing up. Bit of a long way from the electrical hook up point for our pitch so had to trail it over the ajoining pitch. Did not use the swimming pool, but wouldn't want a pitch near it as the pump was very noisy. We had a lovely pitch overlooking the river with lovely walks directly from the site. We were here 4 nights with very variable weather.The pitches are level and drain well in wet weather with the ones by the river very pleasant.The unisex toilet block is modern and very clean. The staff were excellent but with little English. There is a bar, a little expensive, and free wifi around reception/bar. There are very pleasant walks along the river and into town but we found the town of Durtal a bit dull and disappointing. A massive chateau and not a lot else. But the surroundin area is good. Lovely location close to centre of very small town with huge chateau. Site spread for some distance along Le Loir with good short walks in both directions. River calm with canoes for hire. Pick up the free map with town walk in the tourist office near the chateau. Excellent new sanitary block. Restaurant, bar and free wifi spot. Not just a stopover, worth a few days. Vil du booke campingplassen Campingplass Les Portes de l'Anjou eller få mer informasjon? Det går bra med opplysningene nedenfor eller via campingplassens nettsted. 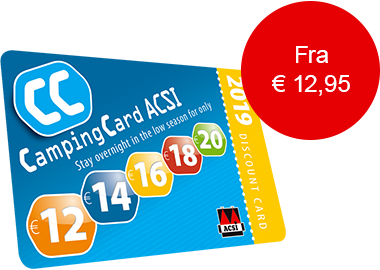 ACSI Eurocampings sender din forespørsel til "Campingplass Les Portes de l'Anjou".